Brief Synopsis – Epic tale of the Austrian Princess who became the last Queen of France. My Take on it – This is a film that I was interested in seeing due to the fact that I’ve always enjoyed history and was interested in seeing how they could present this story. 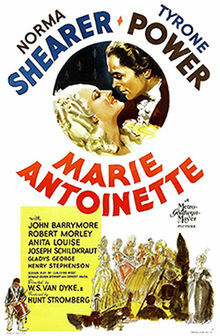 They do a nice job showing the life story of Marie Antoinette and her connection to the eventual French Revolution. This movie is done in epic fashion and despite the fact that it isn’t perfect, they still do a nice job showing the lavish lifestyle of the French upper class at the time and how it could have caused so many ripples among the lower and middle class. Norma Shearer is superb in the title role and was quite deserving of an Oscar nomination for Best Actress for her performance here. I liked the way that they showed how her life evolved over the course of the years and the path she chose in order to seek and feel love that she felt she deserved. Besides Shearer, the rest of the cast is also quite good but the standout among them all is Robert Morley as her husband King Louis XVI. He plays the character extremely well and his arc is shown really well as we get to see how he changes through the course of the events of the story. He seems quite shy around his new wife yet also is aware of the fact that she is the only way that he will have a heir to succeed him on the throne of France. Bottom Line – Interesting take on the story of Marie Antoinette and the French Revolution. Shearer is great in the lead and was quite deserving of her Oscar nomination for Best Actress for this performance. They do a great job showing the way that her life evolved and we get to also see how much happened in her search for true love. This is truly an epic production even if it’s not perfect. The rest of the cast is quite good too and Morley definitely stands out as her husband who is quite shy around here even if he knows that she is the way for him to eventually have an heir for the throne. Recommended!